Senior Eileen Zenus gains momentum in preparation to make a pass during South Pasadena's 14-2 win over Pasadena. The win improves the team's record to 3-0 heading into its final game of the preseason. 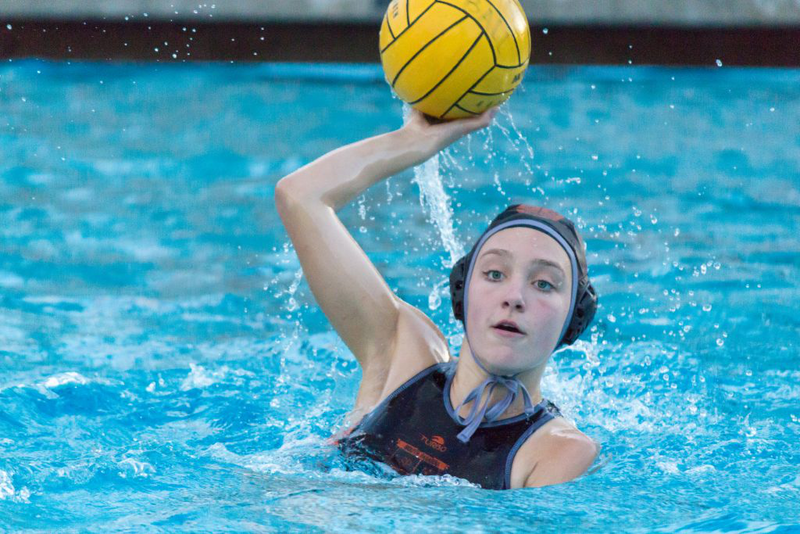 Girls’ water polo picked up another preseason win at home on Tuesday, December 12th, in a 14-2 victory over the neighboring Pasadena High School (PHS). The win brought the team’s record to 3-0, a strong position preparing for league play. After South Pasadena dominance defined the first half, the Tigers eased off their high octane offense, in exchange for ball security in the second half. Less than a minute into the first quarter, South Pasadena began to build its scoring streak, as Alison Lao launched a shot into the lower right corner of the PHS cage. Aggressive defensive maneuvers by South Pasadena initiated several quick PHS turnovers, that were rewarded with an additional three goals for South Pasadena. Charging back, two PHS players committed fouls, temporarily suspending them from play for 20 seconds, as they attempted to secure a goal in the first quarter. After PHS failed to build up a score, the first quarter ended with a South Pasadena lead of 4-0. The Tigers were determined to advance their lead as they scored four goals within the first three minutes of the second period. The team’s third goal was scored off of a dynamic play from Lao and freshman Amanda Kamaly. After Kamaly became available for a shot in front of the goal, a pass from Lao allowed her to send a bullet flying past the PHS goalkeeper into the upper right corner. The squad was slowed down however, after junior Olivia Hunt was temporarily suspended for swimming over a PHS player, the Bulldogs managed to slip a shot past South Pasadena junior goalie Rachel Grey. The PHS goal constituted another strong response, resulting with two more points awarded to South Pasadena, ending the first half with a nine point lead, 10-1. After halftime South Pasadena slowed their offensive attacks, which allowed . South Pasadena narrowly increased its lead with merely two goals in the entire third quarter. Trailing by ten and clearly aggravated, Pasadena managed to place another shot past Grey after back and forth turnovers and swimming across the pool. The third quarter ended, further solidifying the South Pasadena lead going into the final stretch of the game 12-2. Regardless of its strong ten point lead, South Pasadena entered the fourth period aggressively as Lao was excluded about a minute into the quarter. Because of the lopsided score, the final quarter slowly dragged on until another South Pasadena goal was scored by junior Jael Osborne around halfway into the period. Later, with two minutes remaining senior Venus Vu scored her first goal of the season, ending the game in a strong South Pasadena victory 14-2. Girls’ water polo will travel to Warren High School to take on the Bears on Thursday, December 14th.